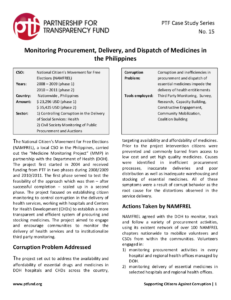 The National Citizen’s Movement for Free Elections (NAMFREL), a local CSO in the Philippines, carried out the “Medicine Monitoring Project” (MMP) in partnership with the Department of Health (DOH). The project first started in 2004 and received funding from PTF in two phases during 2008/2009 and 2010/2011. The first phase served to test the feasibility of the approach which was then – after successful completion – scaled up in a second phase. The project focused on establishing citizen monitoring to control corruption in the delivery of health services, working with hospitals and Centers for Health Development (CHDs) to establish a more transparent and efficient system of procuring and stocking medicines. The project aimed to engage and encourage communities to monitor the delivery of health services and to institutionalize third party monitoring.